DESCRIPTION: I chose for this project to draw something different, so I picked three individual species of cephalopds that I see as unique species to the family and for the media I used technical pens and brush markers. Firstly the blue ringed octopus one of the smallest species but also unique in how it looks and also the most dangerous due to it's poison in comparison to it's size.Secondly the cuttlefish which is purely down it appearance and the curiosity that surrounds it and last is the giant squid which is the largest and perhaps the rarest and largely unknown to science and parlty only recently rediscovered back in 2012 and were thought to be extinct prior to that. 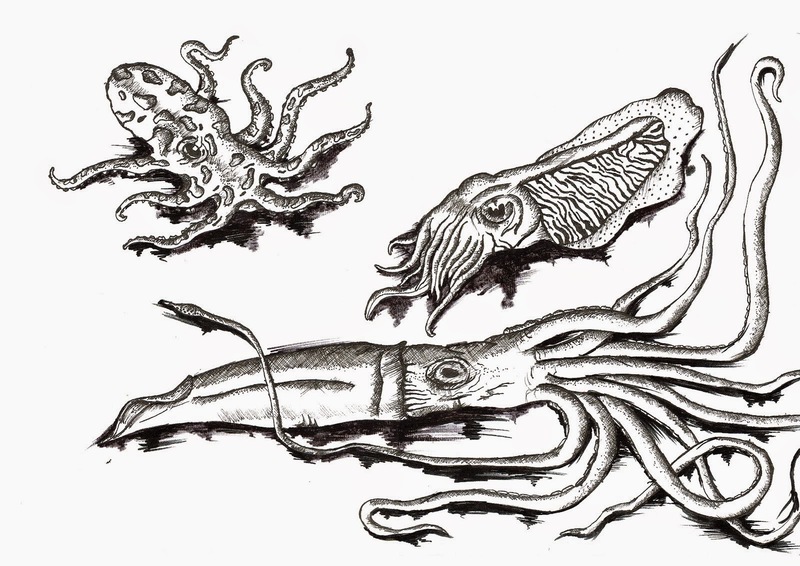 Generally all species of cephalopods are unusual in their nature for what you expect of most invertebrates I have just picked what I see to be key species.